(0 Customer Reviews) | Write Review 6 issues per year Gambling Insider is the premier business-to-business publication for the gaming industry. Each issue brings you the inside track on the global gambling market, interviews with the field’s biggest movers and shakers, and in-depth analysis from some of the sharpest minds in the business. Gambling Insider offers expert perspective on all the industry’s major talking points from online regulation in the US to the expansion of the European gaming market – all backed up by first-rate comment and astute debate from the people on the inside. Gambling Insider provides a comprehensive review of developments across all sections of the gaming industry, reporting back from the year’s biggest conventions to make sure that you don’t miss a thing from the gambling world. Whether you’re a software provider, payment processor, operator or affiliate, Gambling Insider is the only publication you’ll ever need to help spearhead your business and stay well ahead of the competition. 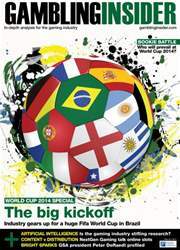 Bookie Battle: Who will prevail at World Cup 2014? Artificial Intelligence: Is the gaming industry stifling research? Gambling Insider is the premier business-to-business publication for the gaming industry. Each issue brings you the inside track on the global gambling market, interviews with the field’s biggest movers and shakers, and in-depth analysis from some of the sharpest minds in the business. 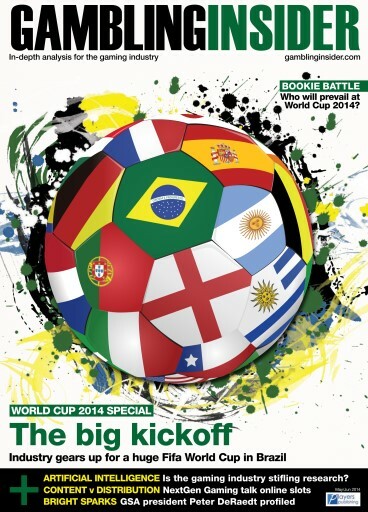 You'll receive 6 issues during a 1 year Gambling Insider magazine subscription. You'll receive 6 issues during a 1 year Gambling Insider magazine print subscription.